Grace graduated from the College of Charleston with a degree in Exercise Science and then proceeded to attend the Medical University of South Carolina for her doctorate of physical therapy degree. Grace spent a lot of time throughout physical therapy school working with children with multiple diagnoses and activity levels. 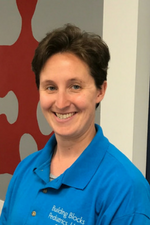 She has experience working with kids in a hospital setting as well as outpatient and aquatics. In her free time, Grace enjoys spending time with her husband and animals, sewing, and being outdoors.